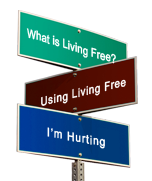 Facilitator/Group Leader Certification: Anyone who would like to know more about Living Free and how they can get involved in helping people overcome life-controlling problems. No Experience Required. Certification for Facilitating/Leading Living Free Support Groups. Overview: This is an online independent study course with opportunities for sharing in an online class forum and weekly, 1 hour, video conferencing meetings (Several times and days of the week available to be determined by the first week after course opens). Each participant will be required to follow the course of study for each chapter and be required to participant in weekly video conferencing discussions. There is required reading and video in each chapter as you progress through the course. This course is scheduled to last 4-5 weeks. Once you have registered, you will be given further instructions 3 days before the course opens on how to start the course. Registration Ends 4 days prior to the start of the course. Recommended book: Living Free Participant’s Guide for those seeking Facilitator Certification - Available Free download for Leaders outside the United States after registration and by request.